Includes two gallons of water based bonding adhesive, 150 Feet of butyl tape used to seal around all the accessories and molding, and six tubes of lap sealant Each kit comes with easy-to-follow instructions. Dicor has secured the best combination of products to make installation of a Dicor roof covering as easy and reliable as possible. Each component in the kit is formulated, tested and proven in the field to work in combination to create an excellent bond. 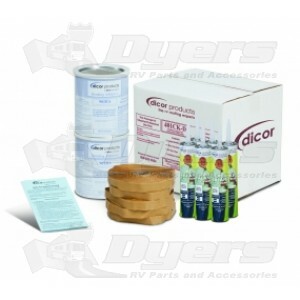 By using this kit, according to the instructions provided, for Dicor EDPM and TPO installation, Dicor warrants that aftermarket product for 12 years.